Summer displays tend to come with warm weather, and this (and yesterday) was no exception. I took also photos, but Jari did the job better. Yesterday was great as well. 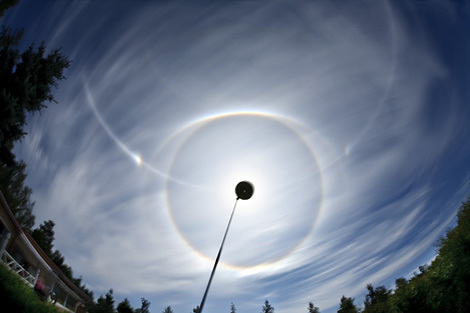 A faint parhelic circle lingered in the sky for hours! I got a full strong parhelic circle but weaker 22halo and it's tangent arcs. I'll put the stack up when I have some time. This display also had a 46-degree halo and an infralateral arc. One has to USM quite heavy handedly in order to clearly see these. It is actually a mystery to me, since the left infralateral arc in particular was easily visible with a mirror. Ok, waiting for your stack, Krusel. New version of Registax is darn good in stacking. Fast, reliable and certain 16bit output. It can handle great number of files, the pyra display in previous post was stacked from 284 tiffs in one go. Jari, that thing you describe is truly odd. I saw also that infra, with naked eye, but had not made stack (and probably will not). By the way, sometimes I have failed to see very faint 46 stuff with mirror that was visible with naked eye. I think naked eye is better because there is no white in those halos, only green-red. Mirror compression somehow makes red-green in the sky. If there is white, then mirror helps. A word is missing from previous comment. Here as it should read: "Mirror compression somehow makes red-green melt in the sky." Yep, a luminance differential is very easy to spot with a mirror. Sometimes one indeed sees for example a faint ZYK (just a chroma differential) better without a mirror. It's weird but it happens. Must pay more attention to this in the future. Perhaps mirror size also contributes to the way the sky appears. At home I mostly use an 8" mirror but otherwise I have smaller mirrors. The extreme compression of a very small mirror is somewhat different than the grand vistas of an 8-incher. Ok, thanks for summing it up in correct terms, Jari. Perhaps other terms would be even better suited here. I think luminance difference is ok but maybe chroma difference is a bit awkward. Color difference? Anyway, it's an interesting issue. As promised..a display from that date in Estonia, Keila. A fine display in Estonia as well. Very nice photo, Marko. Without HDR I'd either lose 22halo+ tangent arcs or parhelic circle...I choosed to have both. Indeed it needs some more work and extra tweaking but the results are sometimes worth it. On site shooting the display it's really hard to decide the correct exposures for the HDR frames, so I usually take 4-6 frames per shot to be safe. It's eating the memory card fast but I'd rather be safe than beating my forehead on the table corner later for not taking the so-so needed but missing exposure frames. On the other hand the latest SLR-cameras have so good LCD displays that you can usually tell if the frame is ok or not unless you're not blinded by the sun when setting up the halo-gear. What software you used for the HDR? I used Photomatix 3. I hope there's better software out there. I'm not sure you'd lose either the 22 deg stuff or the parhelic circle without HDR. Usually those two can be recorded well with a single exposure (my photos from that day are not HDR). However, 9 deg stuff sometimes screams for well executed HDR. This is the best exposure..I'd have used this for the non HDR stack. Of course not loosing 100% entirely bot some of the colours for sure. Can that software align the photos using the sun disk? This looks very good. I'm sure these exposures will yield a great stack after some post processing. HDR, however, seems to offer an interesting alternative route to post processing sky contrast (in comparison to levels, curves etc) with the added benefit of increased dynamic range. Both approaches appear to benefit equally from local contrast enhancement with USM. To riikonen: No sun aligning available. It also depends on the cameras sensor chip...how much dynamic range you can get out of it. Knowing my camera which is over three years old by now I'm sure at this point that the HDR processing has its benefits over the single file processing especially with the displays when the sky is covered by annoying white glow or in cases when the contrast decreases dramatically. Taking 4-6 shots every 10 seconds does definitely eat memory card space quickly. And the amount of afterprocessing is huge! But the results are great, as Krusel's photo show. I usually do not use but one exposure time, even for odd radii -displays. Shooting RAW makes it possible to convert differently exposed tiffs out of one RAW image. Of course the dynamics of the chip plays a big role here. With this method the usable tuning range is maybe something like plus minus 1EV, although most converters allow much larger range. Most of the time I have been too lazy to make HDR -images, but most of the time stacks turn out fine without it. Nice photos you got guys I got lower 23d arc in Florida while on vacation and I got a waterspout my first tornado!!! :) I also go very nice odd radius halos yeaterday showing 5 or more rings.